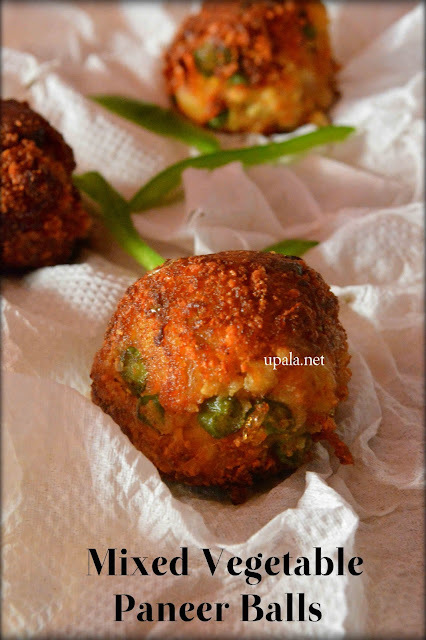 Mixed Vegetable Paneer Balls are yummy evening snack that goes well with Tomato ketchup. 1) Pressure cook the potato, after it cools peel the skin, mash it and set aside. Heat oil in a kadai, add onion and fry till light brown. Next add Ginger Garlic paste and fry. 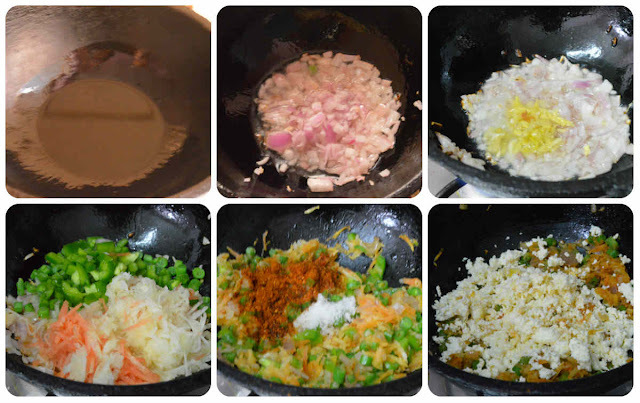 2) Add Capsicum, Carrot, Kohlrabi, Beans, Green peas, Green Chilli and fry till they gets cooked in oil. Maintain low flame to avoid getting burnt. 3) Add Garam masala, Salt and mix well. Now add Crumbled Panneer and mix again. 4) Now add mashed pototo and mix well. Sprinkle Corn flour and mix again. By this time all the water content would have got absorbed and we will get a dry Paneer vegetable mixture. 5) Switch off the flame and leave it to rest for few minutes. Make medium size balls of all the mixture and set aside. 6) Heat oil in a kadai and drop 3-4 balls at a time and leave it to cook in medium flame. 7) After one side is cooked, carefully flip it around to cook other side. Be careful while flipping as the balls might break. 8) After both sides are cooked and turns goldeen brown, remove them from oil and place them on a paper napkin. 9) Repeat the same for rest of the Vegetable paneer balls. 1) Other vegetables that you can add are grated beetroot, finely chopped cabbage. You can even add finely chopped Palak. You can alter the vegetables according to your choice. 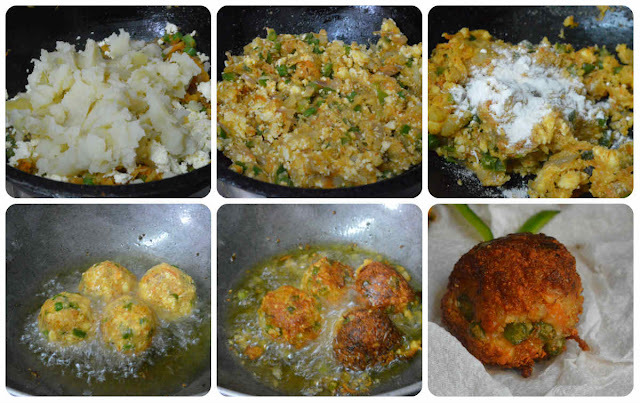 2) In addition to green chillies you can also add red chilli powder if you want spicy balls. 3) You can also add finely chopped Coriander leaves or finely chopped Mint leaves for different flavour. 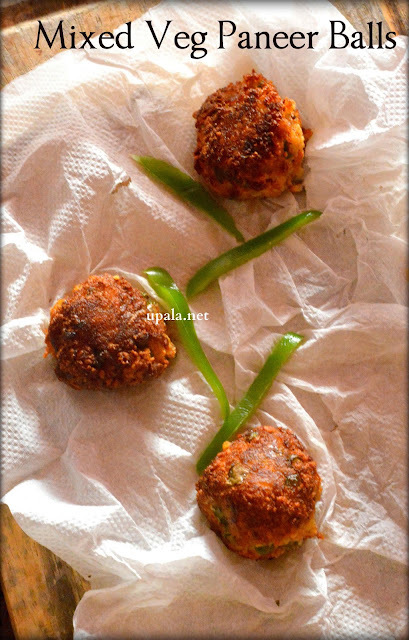 1) You can also roll the balls in maida paste and roll it in bread crumbs like how we do for cutlet. This gives extra crispy outer layer. 2) With the same Vegetable paneer mixture, you can make it in flat shape and cook it on a flat tawa with less oil.